The EU decided to postpone Brexit until October 31st. While the cliff edge was averted, uncertainty remains high. GBP/USD is trading just below 1.3100, digesting the late-night news from Brussels and not going anywhere fast at this point. After a contentious meeting, the EU decided to extend Brexit until October 31st, Halloween night. Most European leaders wanted to grant a longer extension to prevent recurring deadlines and summits. However, French President Emmanuel Macron took a hard line and insisted on a shorter extension. He also wanted to impose conditions in order to prevent British distraction during the period. However, the UK continues as a full member, including participation in the European Parliament elections in late May. European Council President Donald Tusk called the UK not to waste this time and also said that the UK could revoke Article 50 and cancel Brexit altogether. While canceling Brexit remains a remote option, the lack of reaction in GBP/USD is somewhat strange. A delay was priced into the pound, and hardly anybody thought a hard Brexit on Friday was on the cards. However, we do not even see a "sell the fact" move. It seems that markets are waiting for responses in the UK. PM Theresa May will update Parliament on the developments and responses from Brexit-supporting ministers and MPs will be of interest. Will they try to oust her? In this case, the high level of uncertainty could weigh on the pound. However, pro-Remain ministers such as Chancellor Phillip Hammond are fighting back. Talks with the opposition Labour Party continue in the background. If May goes for a softer version of Brexit that Labour wants, the pound has room to rise. GBP/USD can also move on US developments. The FOMC Meeting Minutes showed that the world's most powerful central bank is firmly on hold and could even cut interest rates. Markets are pricing such a probability, and the Fed is gradually opening the door to this option. There are no significant events on the UK economic calendar. In the US, the Producer Price Index (PPI) is due later, but it usually doesn't rock the boat. Several Fed members, Clarida, Williams, Bullard, and Bowman, will speak later on, and they could have a more substantial impact. All in all, UK political developments will likely have the most substantial impact. 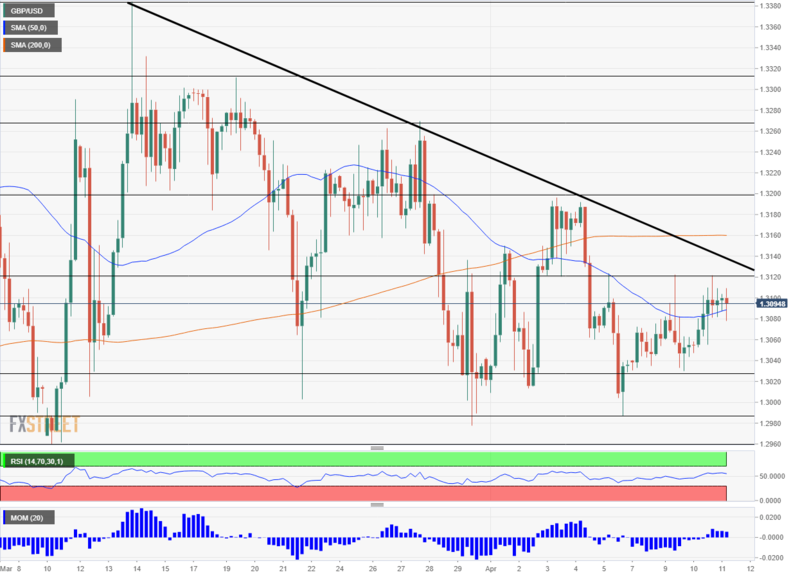 GBP/USD enjoys upside Momentum on the four-hour chart, a Relative Strength Index that is slightly above 50 and it is also trading above the 50 Simple Moving Average. However, none of these indicators is significant. On the other hand, the pair is capped by the downtrend resistance line that begins from the early March peak. Immediate resistance awaits at 1.3120 which is the recent high. Further up, 1.3200 was the high last week. 1.3270 was the peak beforehand, and 1.3330 before that. Looking down, 1.3030 was a low point earlier this week, and 1.2990 was a swing low last week. 1.2960 was the low point in March, and 1.2895 is next.